Hey everyone, I know it has been a while since an update on here. The problem is that the work recently on the code hasn’t really produced anything worth looking at. 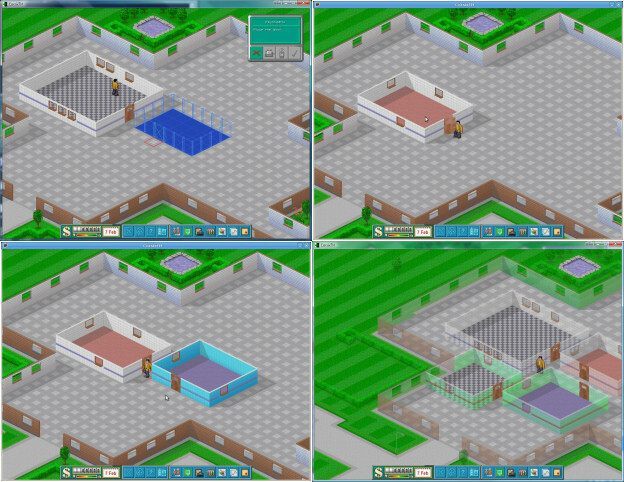 The other project is Java Hospital, which does not use the original graphics and is top down. And written in Java. I don’t have any screenshots of this right now. Both projects have new sub-forums at the OpenTH forums, so the community can be kept together. Feel free to post and give your opinions! What annoys you about Theme Hospital? For some reason I don’t understand, you can’t put a window or door at the end of a room. This is so annoying! The minimum size of a toilet is too big. Sometimes you just want a few small ones about rather than big ones. Some objects can’t be rotated. Grr! You can’t tell a member of staff “Stay in your room for a while. Stop trying to go to the staff room!”. This would help a lot during emergences. Lack of staff zoning. Really need this! You cannot add external windows, despite them being the only sort of window which really makes sense. Staff seem to want a pay rise for absolutely no reason sometimes. I don’t always think advisor is so helpful. Why don’t patients like my hospital? How comes I’m always half way to winning? How the heck can somebody be stuck in my hospital? When in slow mode, the flashing blue lights on top of the person indicating they are emergency patients flash slower (when looking at them in a queue of a room). It’s very annoying as you can’t tell who are the emergency patients. It is annoying when you make an (e.g.) X-Ray room of minimum size and are trying to squeeze everything in there. I wish there was a sort of ‘standard layouts’ button. So you make the outline, place the door and then just click “Standard layout” and it makes one. Why can I only put litter bins inside rooms? I want them in the corridors! Why can’t a train consultants to learn a skill? It is so annoying to train a doctor to get a skill and then they become a consultant just before gaining the skill, so they can’t train anymore. The levels don’t have enough variety. I think you often get too much space, too. When you drop a doctor on the room, he’ll often just leave immediately to go to another room. On the other hand, a consultant goes to a room and then stays there for ages and gets unhappy. Can’t I tell them to go to the staff room when idle or something? Can anyone add their own pet hates to this list?